37’ - This is #fun with #soccer . 38’ - RT if Clint Dempsey is your bae ????. Fave if Obafemi Martins is your bae ????. Eat a cooke if they’re both your bae ????. 39’ - Colorado with a little surge forward, Sounders holding here as Brown’s header goes wayyyyy over. 41’ - Brown again gets forward and has a crack but Frei takes it in the midsection with ease. 42’ - Sounders NEARLY get another as the FK comes in, headed out and popped back in…but Irwin gets there ahead of Neagle. 43’ - Goal for Colorado! It’s Brown. The ball bounces around the area and ends with Brown poking it home. 44’ - Not how the Sounders wanted to end this half. The goals will come…but that defense. 45’ - Neagle taps it home to extend the Sounders lead to 4-1…butttttttttttttt he’s offside. Great little move by Ozzie there though. HT - Change coming here as Zat Knight, the former Fulham, Bolton, others vet will come in. He’s massive, BTW. HT - Wynne comes off for Knight. 46’ - We are back! @SoundersFC up 3-1 over the Rapids here. 47’ - Calm move there by Knight to play the ball back to Irwin with Oba on the prowl. Rawrrrrrrr. FT - THAT IS IT! 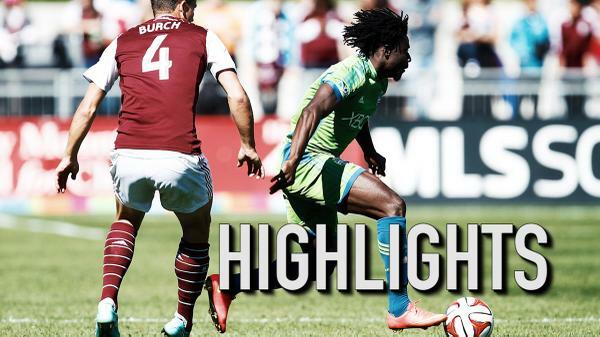 The @SoundersFC is back in 1st place after a 4-1 victory over the @ColoradoRapids ! Is it because we scored more than them this time and they scored less? RT @LikkitP : 1-4 last year, 4-1 this year. I like this year better. 8, count em, 8 goals in last 2 games for @SoundersFC . Ruthlessly exploited a demoralized Rapids. 3 games to go for Supporters Shield..
You guys know what today's victory means! You can get 50% off any LRG or XLG @SEAPapaJohns pizza on Monday! Order with the code "SFCWINS". Congrats @SoundersFC on a solid performance in Denver. Very professional.